During the ceremony commemorating the 16th Gyalwang Karmapa, Rangjung Rigpe Dorje, three volumes of his collected works were released. Published jointly by the Tsurphu Labrang and Amnye Machen Institute, these texts are a landmark of the Karma Kamtsang lineage and continue the tradition of gathering the words of the Karmapas to make them more widely available. The volumes of the collected works are beautifully produced with covers, chapter openings and running heads in burnished gold. The three volumes of over 300 pages each, contain a wide range of works, including the records of the Dharma the 16th Karmapa received—empowerments, reading transmissions, commentaries and other teachings; letters recognizing reincarnate lamas; the prayers for the swift return of lamas who have passed away; the advice he gave; and the rules, regulations, and curriculum for his monastic colleges (shedra); life stories written by others and autobiographies; and his own compositions, including his beautiful and prophetic poetry. 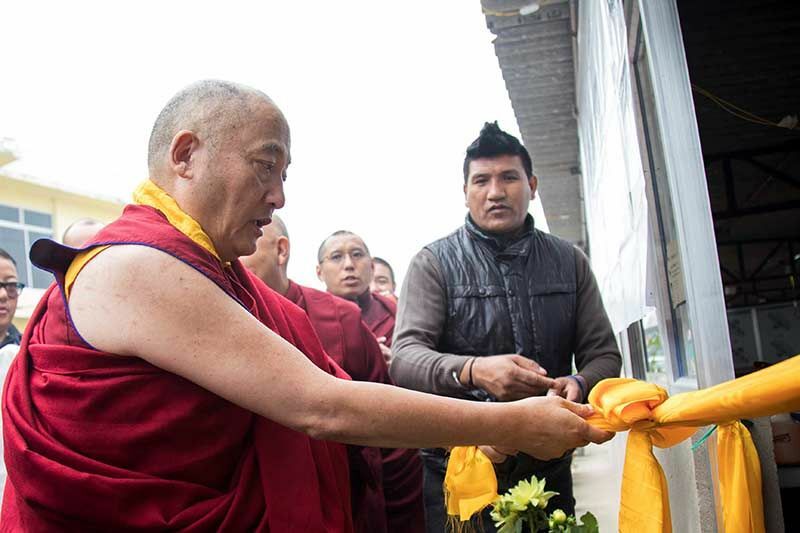 The main person responsible for this project was the historian khenwang Tashi Tsering, the founder of Amnye Machen Institute, whose family has had a long connection with the Karma Kamtsang tradition. 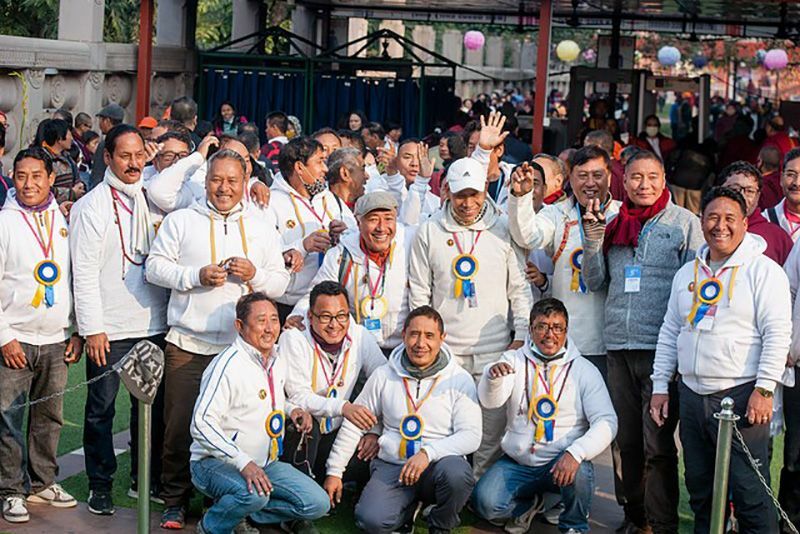 For over thirty years, beginning with his long stay in Rumtek, (the residence of the 16th Karmapa in Sikkim, India), Tashi Tsering collected the writings of the 16th Karmapa, and he was also the main editor. In his introduction to the three volumes, printed in the first one, the 17th Gyalwang Karmapa acknowledged Tashi Tsering’s great contribution, saying that in the beginning, middle, and end with sincere faith and loyalty to the 16th Karmapa, he worked unstintingly in detailed research and with a broad vision using his historian’s knowledge of the succession of rulers and the origins of the Dharma in Tibet to craft these volumes. The Karmapa also gave a brief history of the Collected Works. In 2000, after the Karmapa arrived in India, he first talked to Dzogchen Ponlop Rinpoche about gathering the words of the 16th Karmapa. 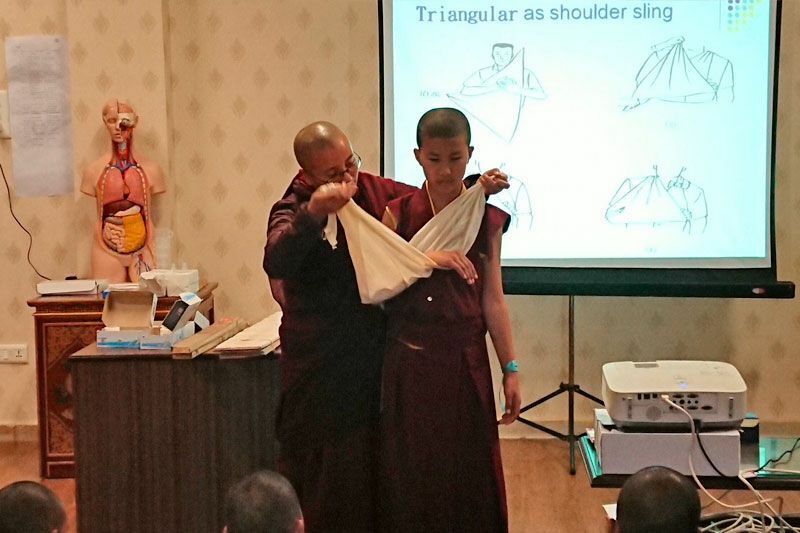 Ponlop Rinpoche offered his support for the project, gave the Karmapa all the writings he had collected, and then worked together with Tashi Tsering. In 2013, the Karmapa related, it was decided to hold this commemoration, and publishing the collected works was considered of utmost importance. And so the search for the 16th Karmapa’s writings was intensified and carried out in Tibet as well as all over the east and west. 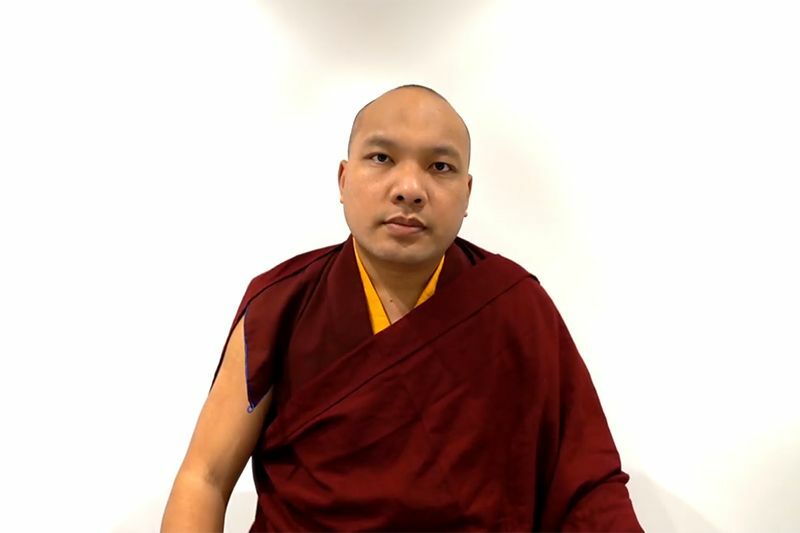 The Karmapa noted that there were still texts to be found in Tibet and other places, so in the future, these would be published in a fourth volume. The Karmapa gave his thanks to those who supported the gathering of the writings and the publication, mentioning Tai Situ Rinpoche, Goshir Gyaltsap Rinpoche, Dzogchen Ponlop Rinpoche, Sangye Nyenpa Rinpoche, Surmang Garwang Rinpoche, Thrangu Rinpoche, and Dilyak Drupon Rinpoche, all of whom knew the 16th Karmapa and witnessed the activities of his body, speech, and mind. The Karmapa also acknowledged the support of other organizations and his own staff in preparing the volumes. Not now, but on a distant tomorrow, it will be decided. Both the vulture and I know where to go. We people do not stay but go to India. Among all his activities, the Khenpo stated, the words and teachings of the 16th Karmapa are his greatest deeds. As the Buddha said, I cannot wash away misdeeds with my hands or transfer my realization to others; it is by teaching the Dharma that I bring beings to peace. In another sutra, the Khenpo mentioned, the stream of teaching is likened to the stream of nectar that flows from teachers or to a moon that shines brightly in the sky. In the catalogue of the Collected Works of the Eighth Karmapa, Mikyo Dorje, it is said that gathering the oral teachings to preserve them is one of the greatest offerings we can make. The actual way to achieve Buddhahood, the Khenpo explained, is through the union of emptiness and compassion, which is made possible through the teachings. For ordinary people to be able to do this, the teachings must be written down. As the words of the Buddha have been gathered, similarly the words of the teacher are gathered into a single collection. This is a wonderful way to spread teachings and extend the activity of the 16th Karmapa. Just as when the Buddha was teaching, the Khenpo explained, a few words of the Dharma were treasured as more precious than life, the great masters of the past searched for the Dharma without any regard for life, intensely practiced them, and finally, they achieved the ability to benefit themselves and others. 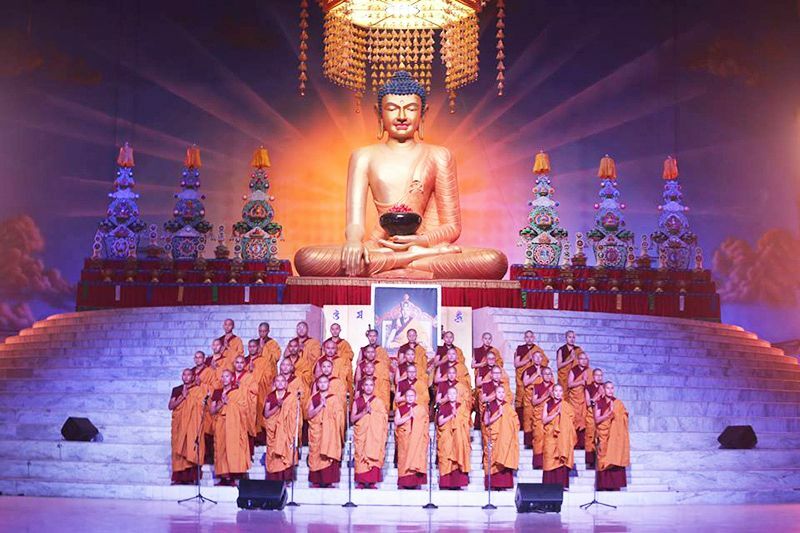 An important service to all the teachings is preserving the Buddha’s words by collecting them in one place and providing the opportunity to read them over and over, so their meaning can be realized. Khenpo Kelsang Nyima ended his presentation with thanks to all who had helped in the publishing of the 16th Karmapa’s Collected Works and with the wish that the great lamas live long like an indestructible vajra, and that all living beings enjoy great good fortune.